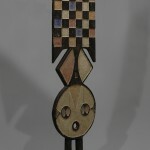 This tall engraved and painted headdress called Bwa Plank Mask was used by the Do society at dances to promote fertility of the fields and at funerals of Do members. The geometric designs all have meanings. The checkerboard pattern symbolizes the separation of light from dark, good from evil, and female from male. The white powder that covers the surface symbolizes that you look into the spirit world through a foggy blur. The geometric designs all have meanings. The checkerboard pattern symbolizes the separation of light from dark, good from evil, and female from male. The Bwa – an ethnic group of about 300,000 people who live in small villages and towns in the West African countries of Burkina Faso and Mali – mark rites of passage such as initiations and funerals with masquerades. These masked performances, which take place primarily during the dry season, enable the Bwa to connect with ancestors and other invisible forces that govern the natural world. While some Bwa have adopted Christianity or Islam, most remain animists, a belief system in which nonhuman entities like animals, plants, inanimate objects, and natural phenomena possess a spiritual essence. For the masquerade, Bwa artists make large masks from leaves or wood, which they then intricately carve and decorate with red, white, and black paint, feathers, and fibers. 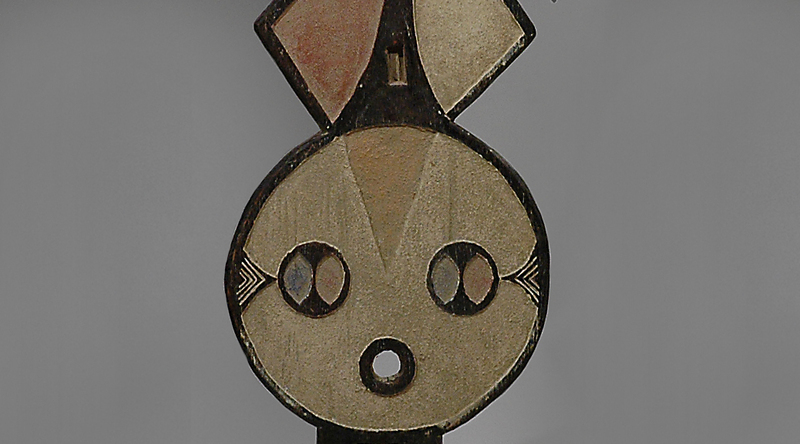 Some of the masks represent recognizable animals such as monkeys, hawks, buffalos, or snakes; while artists decorate others, like this nwantantay, or tall plank mask, with symbolic abstract imagery (crescent moon = women) or geometric patterns (X = crossroads, checkerboard = opposites). Performers attach the masks to black or red fiber costumes, and bite down on rope passing through holes in the mask to secure it to the face while dancing. Yacouba Bonde is not only a sculptor, but he is also an elder, regional chief and artistic director of the Bwa village of Boni. In the latter role, he works with villagers to choreograph initiation masquerades – wherein the masks work together with music and dance – to transition Bwa youth into full-fledged and contributing members of society. 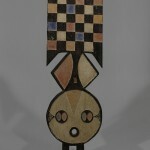 Bwa plank masks have become such an important symbol of national identity in Burkina Faso and Mali that their motifs feature prominently on their common currency, the West African CFA franc, which is also used in Benin, Côte d’Ivoire, Guinea-Bissau, Niger, Senegal, and Togo. 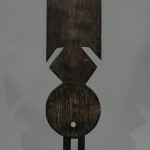 Provenance: Acquired in Burkina Faso by gallerist in Johannesburg from whom we bought it in 1999.